Yeah it looks good for AL and a few flurries for GA af best this run. Icy in NC and mentioned. Totally different look than previously and the other models too. Funny how fast the euro dumped a major arctic invasion. EPS Control. Looks like a good number of the members show snow across GA and SC. Wow. That's more than what I was expecting. Guess we will see how it plays out. Should I start the thread or wait a little? Only if it means I see some snow next week. At your own risk of course. It's 4 to 5 days away now so it's not like its in fantasy land. If you think it will kill the event hold off. What the what!???? Things just got lit and real! I’m all in now! Jimmy, get the beer and bread!! Looking forward to some snow showers tomorrow evening. View attachment 7280 What the what!???? Things just got lit and real! I’m all in now! Jimmy, get the beer and bread!! 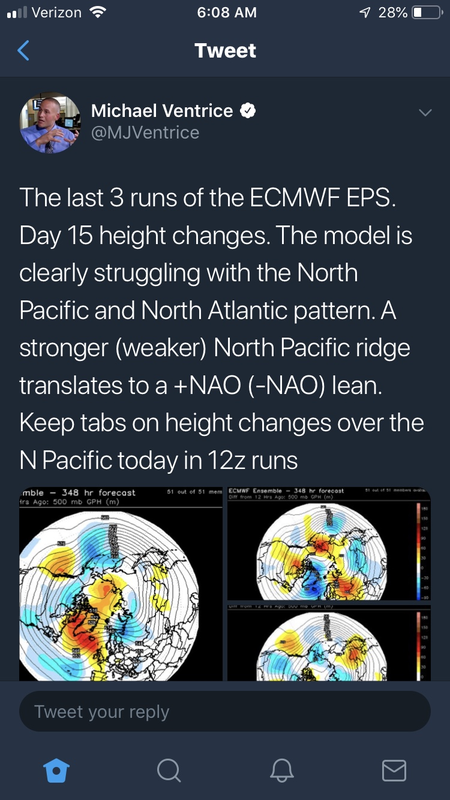 Models struggle with global patterns on Day 15? Lol. The EPS looks to be evolving nicely as we end November. Building Aleutian low and strengthening Scandinavian ridge trying to build down into Greenland. He's already gone on record with his warm east coast winter (+NAO) forecast. He's going to look ignorant if he waffles now. Real talk though. If the northeast can get some snow pack going the cad will be the real deal this winter. Well his earlier tweet he almost sounds giddy. Guessing the SLP anomalies are a precursor to PV destruction. 19 degrees this morning !!!! Looks like after this weeks cold blast, we go zonal, the maybe west coast trough!? Our above normal December looks to be incoming, so we’re going right along as planned! That's fine with me. It will be nice to get a little warmth and then some cold just in time for Christmas. I got down to 25.3 degrees last night and I’m currently at 37 degrees at 1:38 pm. Looks like the snow chances here are all but gone other then some flurries maybe but that’s no surprise. It looked like the long range warmth backed off a little though on today’s runs.